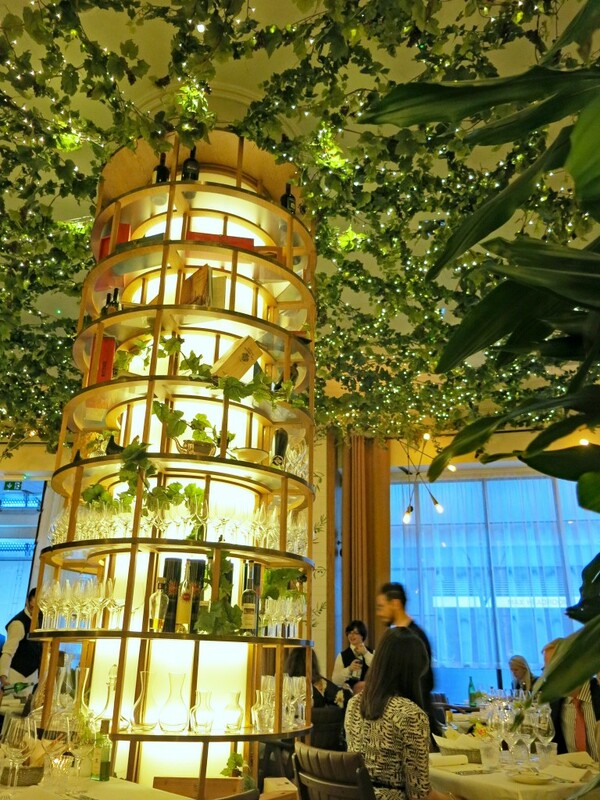 Ristorante Frescobaldi in Mayfair is the first UK restaurant from the famed Tuscan wine making family the Frescobaldi’s. It’s one of Italy’s most celebrated wine dynasties dating back 700 years and 30 generations. Today the Frescobaldi family own 11 estates in Italy including 10 in Tuscany. After enjoying a great selection of wine I think I need to visit at least one of the estates in Tuscany! You know, for research purposes. The restaurant holds Winemakers Dinners to introduce guests to wines from their Estates served alongside their Tuscan-inspired food. This particular evening showcased their Attems Estate, located in the Collio district of Friuli. Head Chef Roberto Reatini created a special 4-course menu to complement the fine wines. 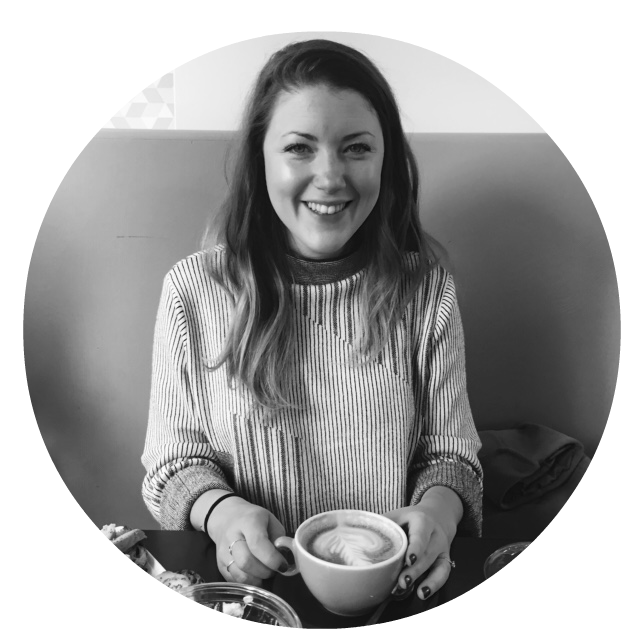 I was very lucky to be invited along on behalf of the lovely Steph – she is a very busy Instagram superstar and so I’m helping to cover some events for her. But I’ll also get to cover them here on my blog too! 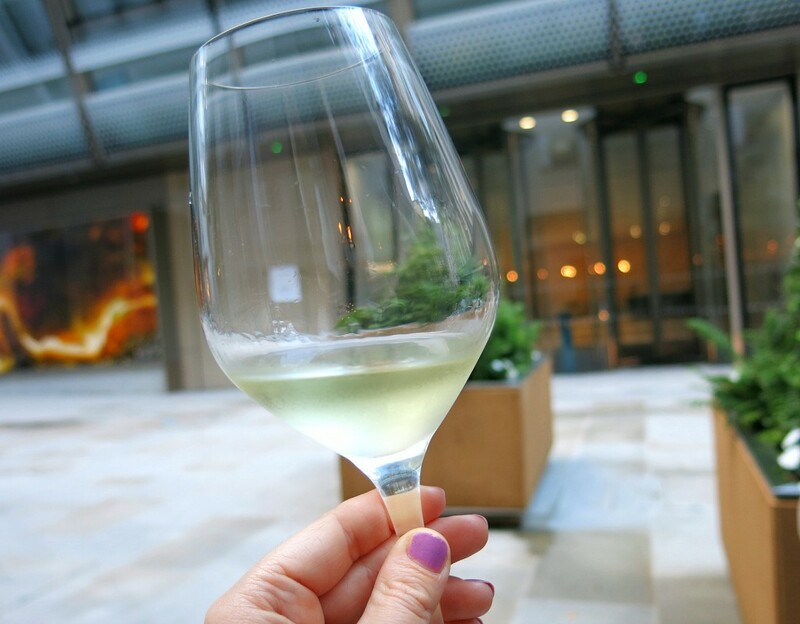 On arrival we were greeted with a lovely cold glass of Attems Friulano 2014, Collio d.o.c. Being a lovely warm summers evening we enjoyed our aperitif and canapés outside. I love London when you can do this! 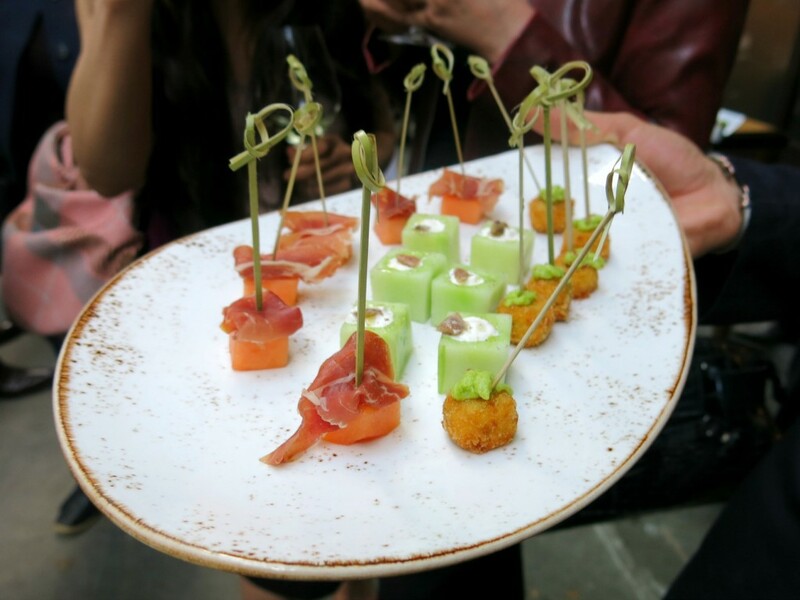 The little bites consisted of juicy melon and proscuitto, cool cucumber and little moreish mouthfuls of croquettes. After catching up with some familiar and new faces (Em, Erin, and Gary) we made our way into the restaurant. It is beautiful; walking in you feel like you’re entering an elegant fairytale. Tables covered with crisp white linen, an almost tree trunk style beacon in the centre of the room with greenery and fairy lights filling the ceiling. It felt quite magical! The Winemakers Dinner comprised of 4 courses paired with Attems wines with a special guest red wine from Luce della Vite. Let’s begin! 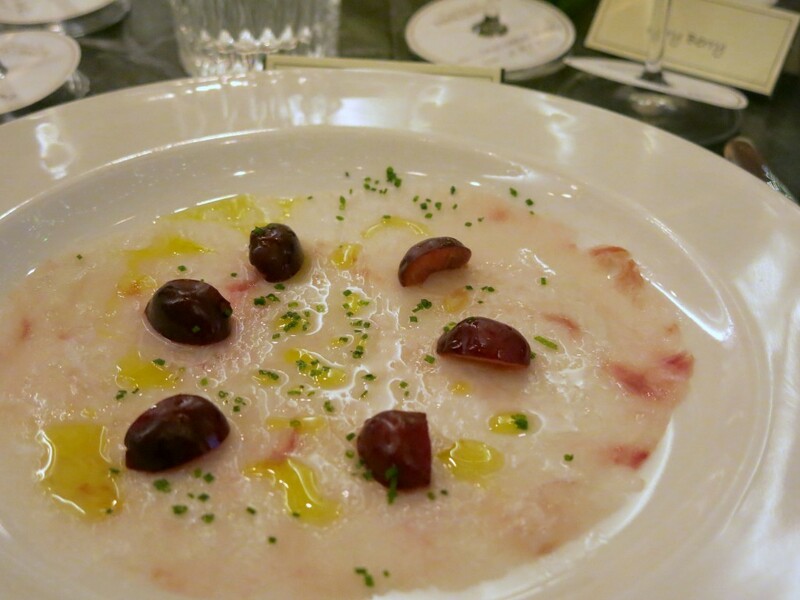 Our first course was sea bass carpaccio with cherries. This antipasti course was served with Attems Pinot Grigio Ramato 2014 and also a glass of Attems Sauvignon Blanc 2015. I love sea bass carpaccio and this did not disappoint! I really enjoyed the cherry, it added a nice tanginess to this fresh dish. 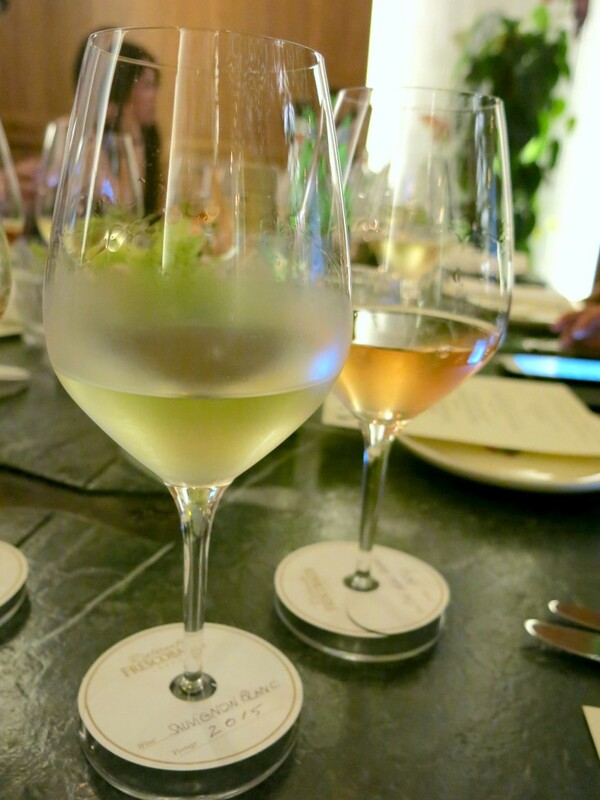 To be honest I didn’t enjoy the Pinot Grigio to begin with but after tasting the food and taking another sip I really enjoyed it – it brings out the cherry and was clearly paired very well. 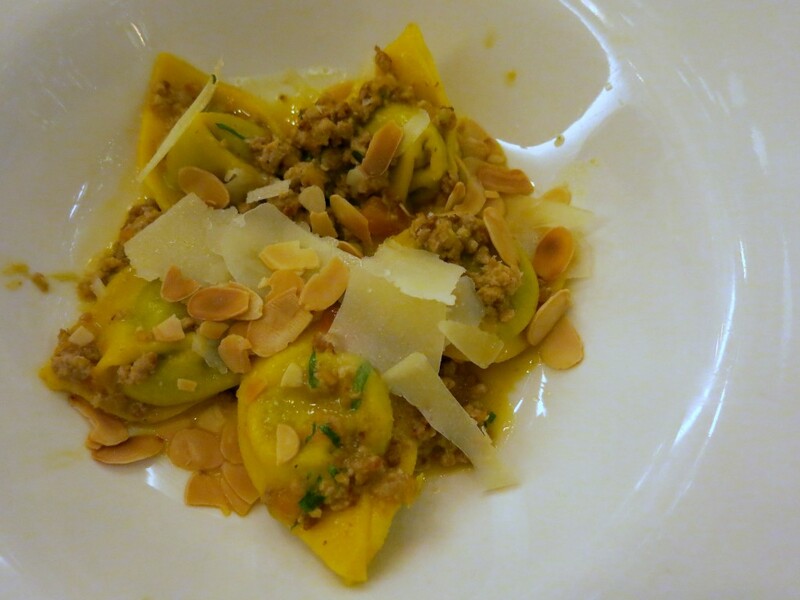 Next we were served courgette ravioli with veal ragu and almonds. The rich veal worked very well with the smooth courgette. The crunchy almonds were a great addition too, adding a nice texture to the dish. The two wines with this course were a little weightier: Attems Cicinis 2013 and Attems Pinot Grigio 2014. Cicinis is one of their greatest wines, and I can see why, it was smooth and rounded and perfect for this course. 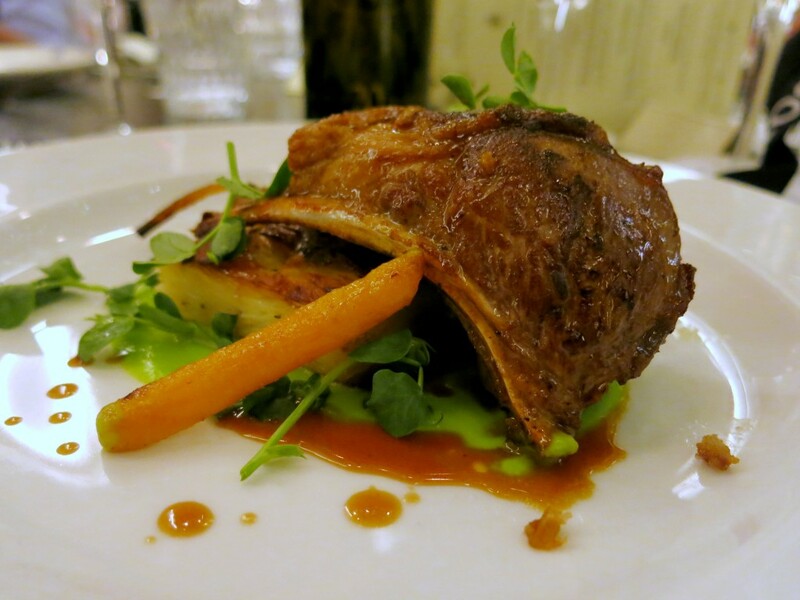 The Secondi Piatti was a lamb rack with pea puree and dauphinoise potatoes. This was another beautiful dish! The lamb was full of flavour and ever so juicy. The earthiness of the pea cut through the richness of the dauphinoise and lamb. It was so good I even ate the last bits of meat straight off the bone! I think the wine made me do it… With this course we were served Luce 2012, Toscana ‘20th anniversary’. This medium bodied red had delicate hints of spicy clove and black pepper. It was rather aromatic and slightly smoky, a great match for this lamb dish. It was getting rather late but before I turned into a pumpkin dessert was served. This semifreddo with melon was my least favourite dish of the night. I enjoyed the fresh melon and sorbet but the rest didn’t really do anything for me, though I was so full by this point I didn’t mind! I did however savour the wine served. To finish the Winemakers Dinner we were served a glass of Attems Picolit 2011. It was sweet and smooth and not sickly at all, it had a richness rather than a sweetness. Very good indeed. Apparently there are only a few hundred bottles of this made a year so I felt very lucky to be enjoying a glass of it! I thoroughly enjoyed my evening at Ristorante Frescobaldi from start to finish. 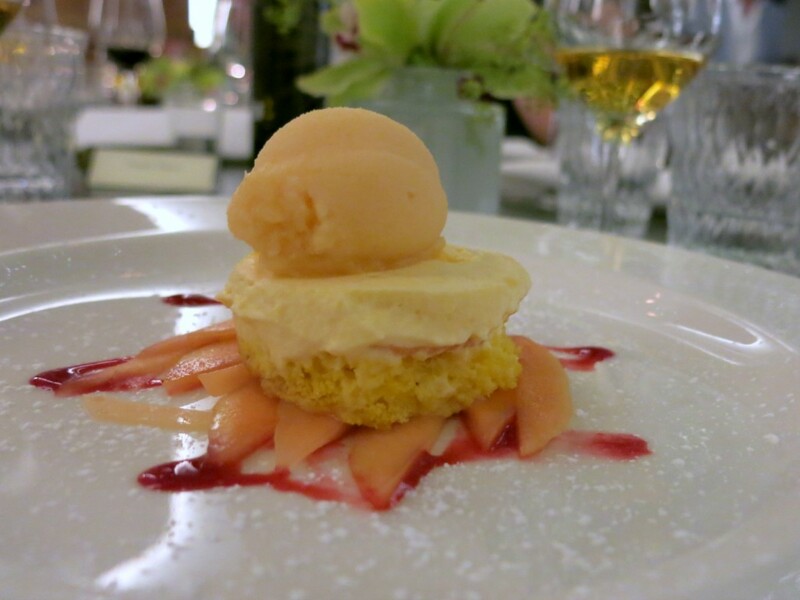 There was a great atmosphere in the restaurant, maybe it was the wine or maybe everyone was content and full from all the delicious food, either way I think at £80 the Winemakers Dinner is great value. The next Winemakers dinner will take place on October. *I was invited as I’m now part of the Eat With Steph team, but all views remain my own. And yes if the lamb is that tasty I will eat it off the bone!